Tech giant Apple Inc. wants a presence in Seattle. They’re following the lead of many other California tech companies moving to Seattle. Apple is moving a development office into 601 Union in the 2 Union Square Building. The building is the 3rd tallest in Seattle, behind the Columbia Center and Seattle Municipal Tower. About 200 Apple employees will occupy the 44th floor and half of the 45th floors of the 2 Union Square Building. According to Mike Levang, of Lease Crutcher Lewis, the project has been under a time crunch from the beginning. Levang says the challenge was restricting work away from business hours so they wouldn’t disturb other businesses in the building. Division 9 Flooring was able to come in and get the flooring piece of the project taken care of without a hitch. Seattle has become a mecca for tech giants. Amazon, Microsoft, Google, Expedia, Zillow and Facebook to name a few. According to a recent ranking from Auction.com, Seattle has the hottest housing market in the country. The tech sector has been a major factor in the growth and has driven employment to an all-time high in Seattle. Some are concerned that Seattle will become like San Francisco, a city that has become unaffordable amid massive growth. The median home price in San Francisco is $1 Million. Seattle Mayor Ed Murray came up with a plan to create 50,000 new housing units in the next ten years, with 20% affordable to those who make 80% or less of the median income in Seattle. Apple Inc. is the world’s second largest technology company. Best knows for the iPod, iPhone, iPad and Mac computers, Apple enjoys a high level of brand loyalty. 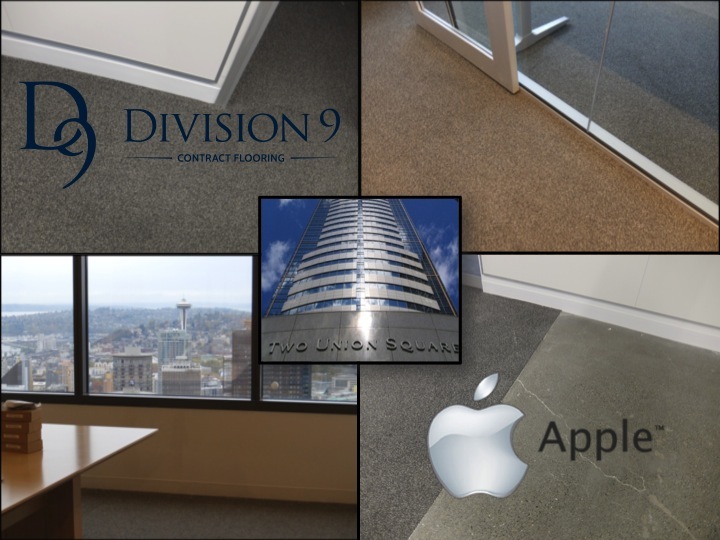 Division 9 Flooring is happy to roll out the corporate welcome carpet in Apple’s new offices at 2 Union Square.